When it’s forty degrees outside, you GOTTA have ice cream! And guess what? You can make a super delicious one at home! Believe us, we are not kidding! In easy breezy five steps you can make some yummy ice cream at home and enjoy with your family and friends! What you will need: 1. 400 ml Cream 2. 1 Milkmaid can 3. 30 Chocolate oreo cookies 4. 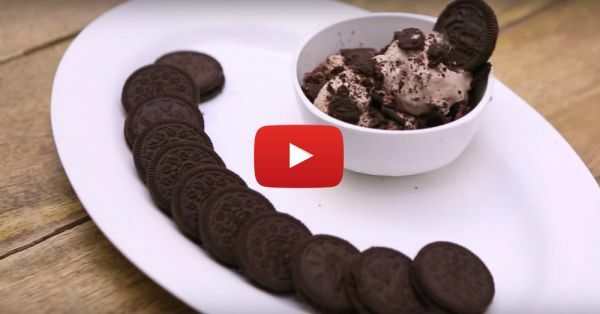 Chocolate sauce Difficulty Level: As easy as eating ice cream Watch the video now!! Step 1: In a bowl churn the cream and then add milkmaid to it. Mix it well. Step 2: Crush the oreos and add them in the milkmaid and cream mixture. Also Watch: How To Make *Delicious* Popsicles At Home! (Keepin’ It Cool!) Step 3: Pour some chocolate sauce in the mixture and stir it well. Step 4: Pour the ice cream mixture in a flat container. Also make sure that the crushed oreos are distributed evenly in the container. Also Watch: Cake In A Mug: How To Make A Super Quick & YUMMY Dessert! Step 5: Refrigerate it for five hours and serve it with chocolate oreo cookies. Making ice cream at home has never been easier! Don’t believe us? Try it on your own!